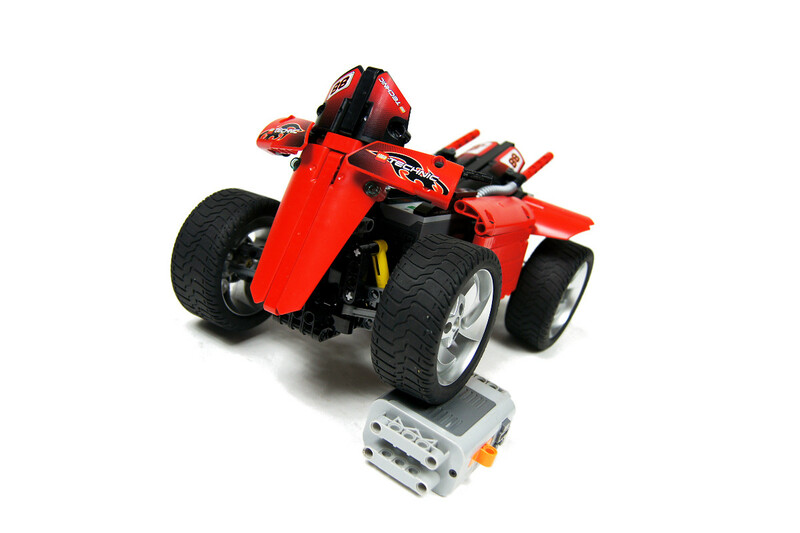 Model of a GG Quad. 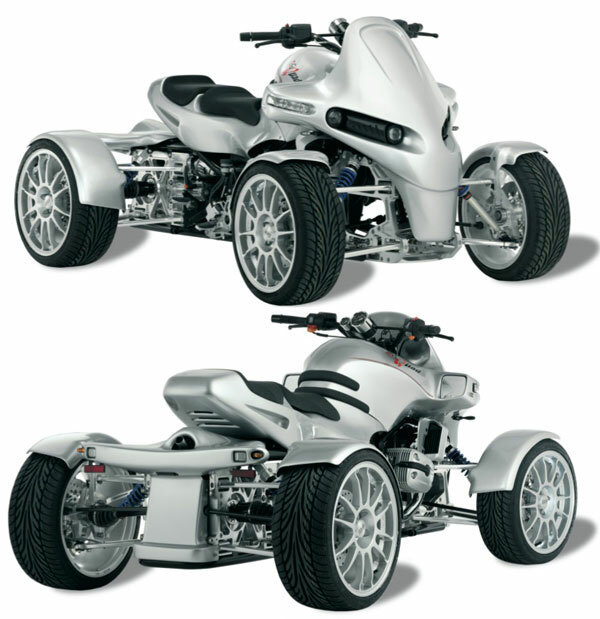 Features full suspension, return-to-center steering system and a powerful propulsion system. My first model which turned out so fast that I was unable to film it inside my apartment. 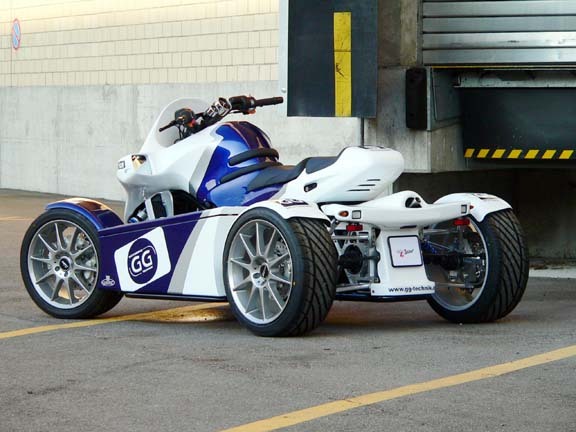 Original GG Quad is a quad/sport car hybrid, a vehicle that’s useless off-road but extremely fast on road. It’s faster that most of the cars or bikes, because it weights less than a car and it’s more stable than a bike, without the need to slow down around corners. 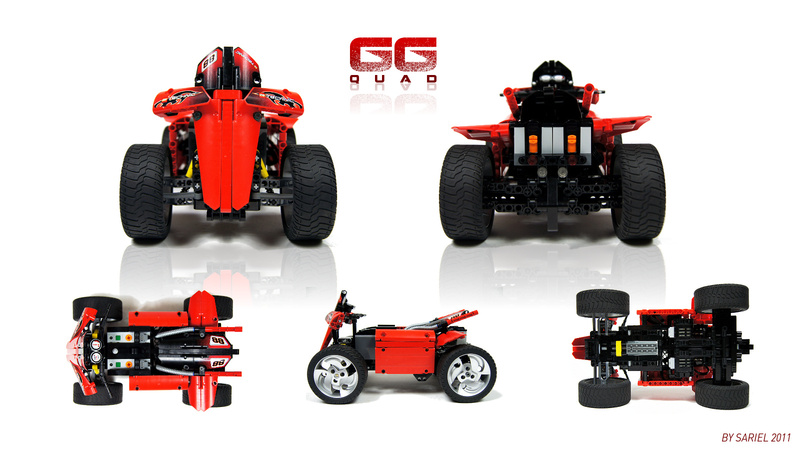 There is also a newer, more powerful version called GG Quadster, but it appeared ugly to me. Technically, the model is pretty much a copy of my Scania racing truck, with a few changes. 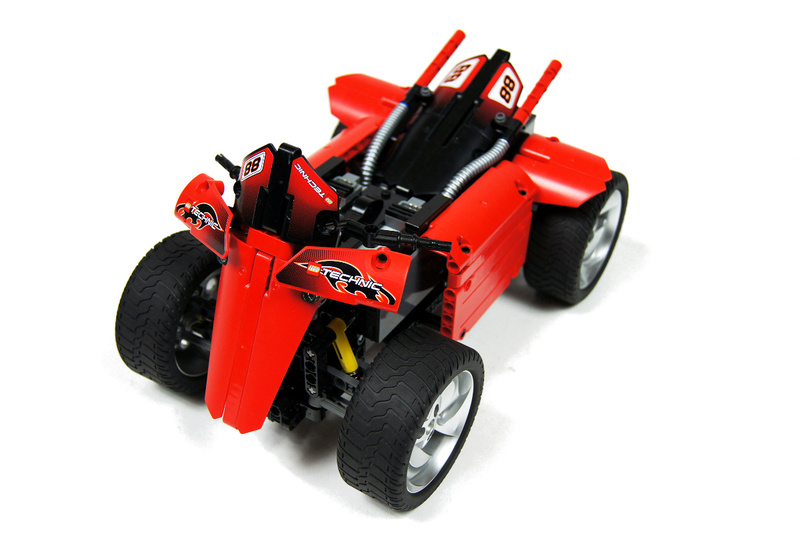 These include a return-to-center steering system (created by simply using this piece), a direct drive, that is no gearing used on the rear axle, and a fully studless, lighter body frame. Just like the Scania, it has an independent front suspension and a dragged rear axle, with two coupled RC motors used to connect the rear axle to the chassis. 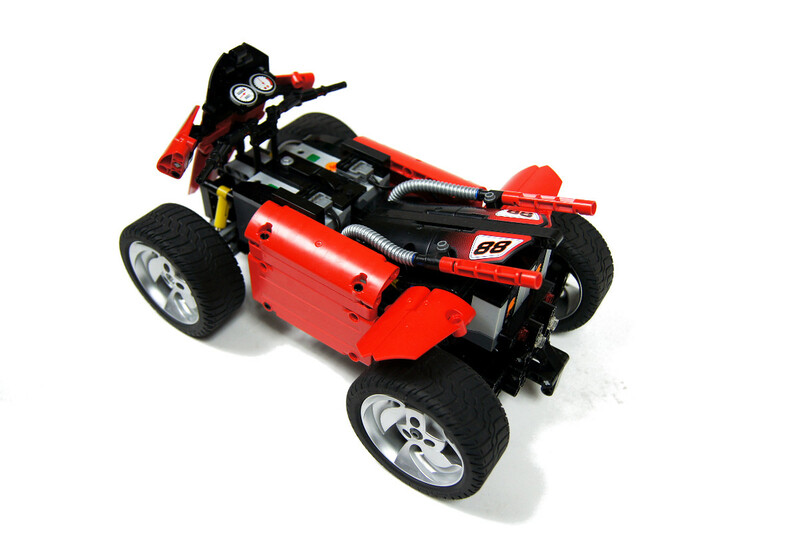 The motors are powered from separate batteries and through separate IR receivers due to their extremely high power consumption, so the model has in fact two independent power supplies and control systems, with motors being only coupled physically by the rear axle. Aesthetically, I was trying to make the model as light as possible without compromising its look too much. It was clear from the beginning that a model with roughly one third of the chassis occupied by batteries alone can’t be made very authentic, but I’ve been trying to find an acceptable compromise. 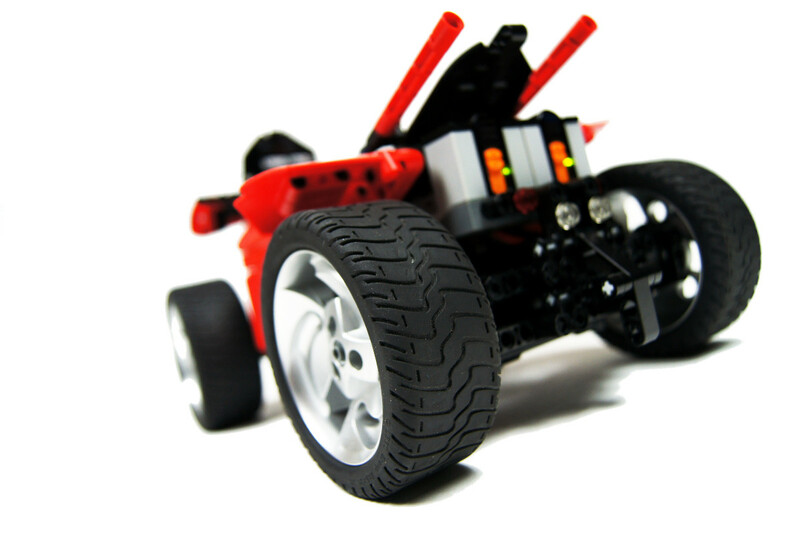 The weight of the bodywork is around 150 grams, so it constitutes a small part of the model’s total weight. It was also necessary to make model as robust as possible, given its speed and the fact that I was forced to drive it outdoors. 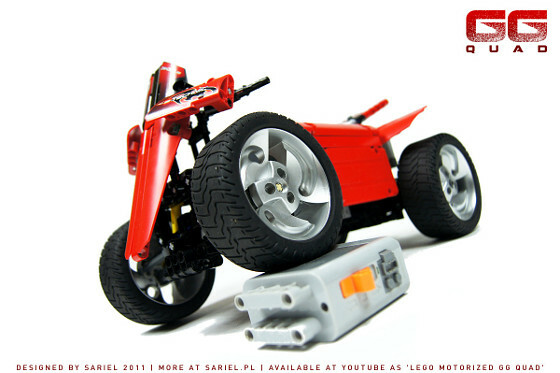 The model certainly has two disadvantages: the front wheels tend to fall off, and the handlebars are fixed. The problem with the front wheels is that I used simple axle pins to hold them in place, and it worked well until the axle pins started to wear out. They were brand new at the beginning, and they looked really shabby in the end. The problem with the handlebars is that making it turn with the front wheels would result in increased weight and complexity, with the latter making the model less robust. The model was fun to play with, and the fact that it wasn’t much faster than my Scania despite being 50% lighter shows that I haven’t used the full potential of the RC motors. I suppose that the next step is to use a gearbox that would allow to switch between RC motor’s slower and faster output remotely. Experimenting with various wheel sizes could also give some interesting results. Tires and rims come from the 8448 set. one Q: tires and rims….some customs or i missed a set having those? 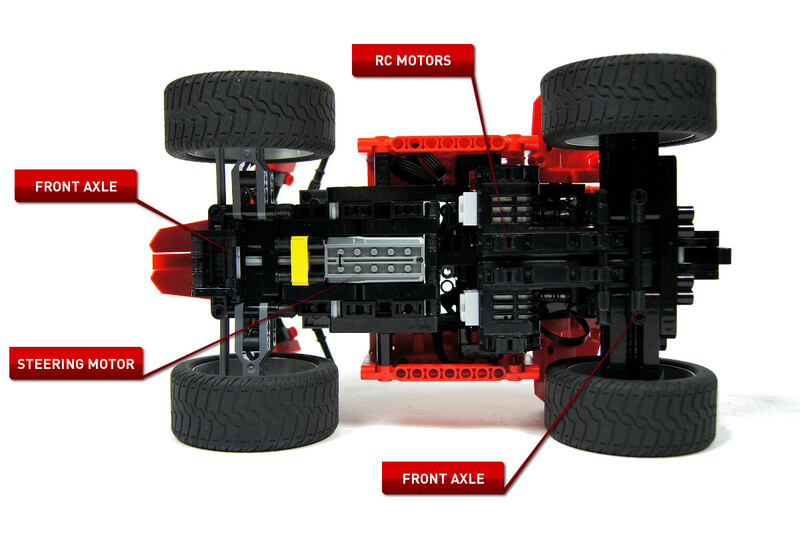 for the front axle, why did you use axle pins instead of the steering arm with 4 ball joints? Which set did the wheels come in ? No, it’s when axle is dragged. what exactly is a dragged axle? is it when the axle moves only up and down? I used PF extension wire. Not exactly a new piece. 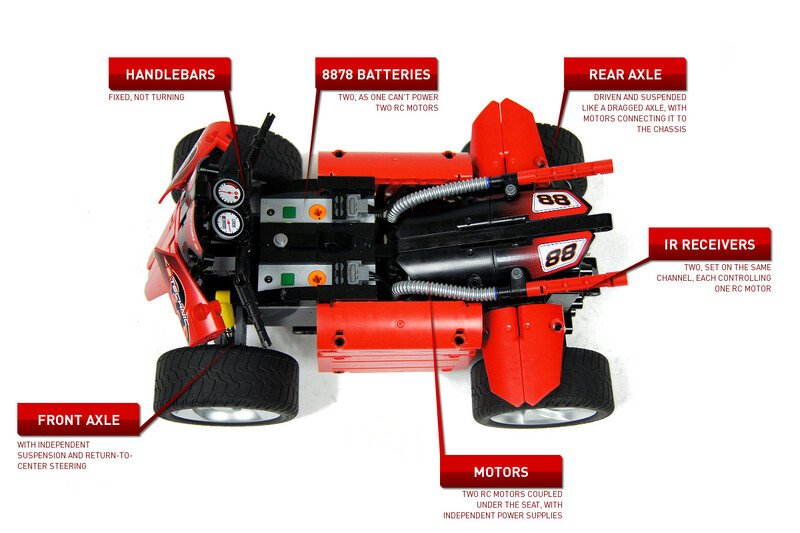 wich wire did you use for connecting the RC motors to the rechargeable battery boxes? 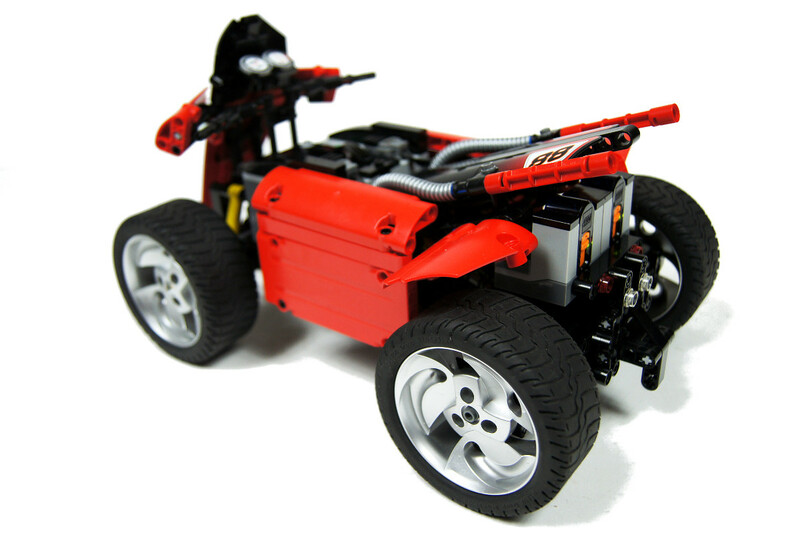 can you connect the RC motors to an normal battery box too? That’s explained in the description. Very nice work! I love your creations. It’s impressive which speed those motors are capable of. Hope you tend to build more “speed” vehicles, love those! Thanks dude. Sorry, I accidentally skipped that paragraph, my bad. You know what’s funny, Sid? The answer is sitting right in front of you, just a couple of paragraphs above, in the description. 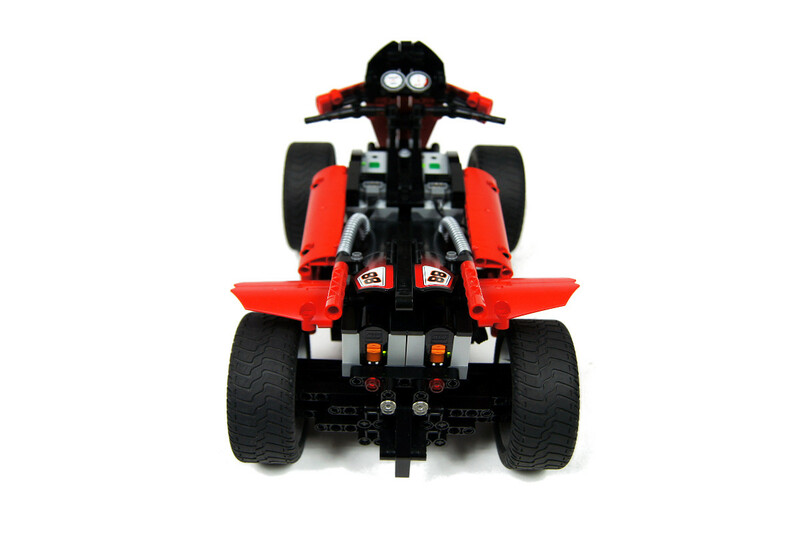 I even provided a link to the Bricklink catalog for that piece. Just read it, it’s not even really long. Ok, thanks buddy. 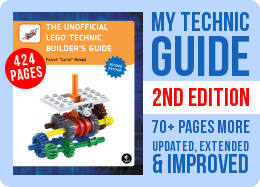 But about that yellow part, was it included in a set or did you buy it from bricklink? Could you please tell me what’s the name of that yellow piece? I didn’t assembly it, the yellow part is a single Lego piece and it makes the whole mechanism work. Great work buddy! I read in the previous comments that you’ve already taken apart your RC model, but still I’d like to ask: how did you assembly the return to center steering part? 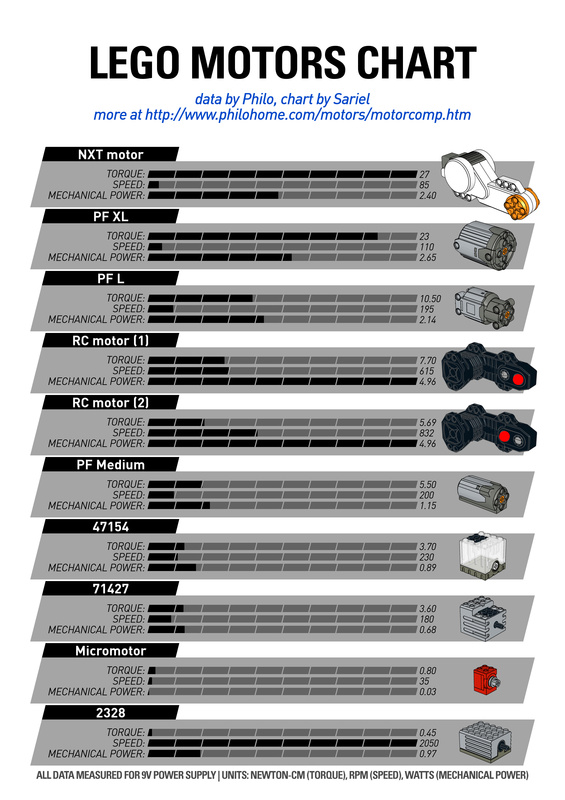 @Ninsei and how many receivers, remotes, and motors do you have? I just think spending money on batteries might be a waste if you didn’t have anything to use them. 🙂 but yeah, I’m jealous. Again: I have taken it apart already. Besides, I doubt many people have two 8878 batteries. Super cool! I also would have been very interested about the instructions! Actually, few “inside” images (partially buillded) would have been sufficent. I have taken it apart already. Besides, I doubt many people have two 8878 batteries. Well, I couldn’t possibly hurl a wheel at her with something that slow. hmmm… yes. She leans down to pick it up.. Strange to see that while making a right turn, the right wheel falls off. I would have guessed the right-wheel would come off in-stead. Anyway, nice model, also the blonde, long-legged one on the bench 😉 I think it’s hard to find ‘in-the-wild’ a woman that is single, sitting on a bench, loving a man playing with his Lego… not impossible, but still. 1. Two cameras, my usual: Sony a33 and Casio Exilim EX-FS10. 3. The blonde lady ignored me completely. Sigh. 1. which camera did you use to film this? 2. wich sw do you use to edit videos? 3. what about the blonde lady sitting on the bench reading a book .. did she react to you filming around her with this little fast red quad goign around? Bardzo fajny. Przypomina mi mój projekt z przed kilku miesięcy . Wzorowany był na quadzie Yamacha Grizzly. Może doczekamy się kolejnej wersji przeprawowej? Oh yes, I know 🙂 I was just wondering what it’d be like with these motors, a V8 engine, and the wheels you used for the Charger. any reason that wheel fell off all the time? Sure they did. And I’ve built a dragster driven by Medium motors a long time ago. It was fast. Did the motors warm at all? Maybe a dragster could be next to try and use the potential of these motors, a really light dragster. 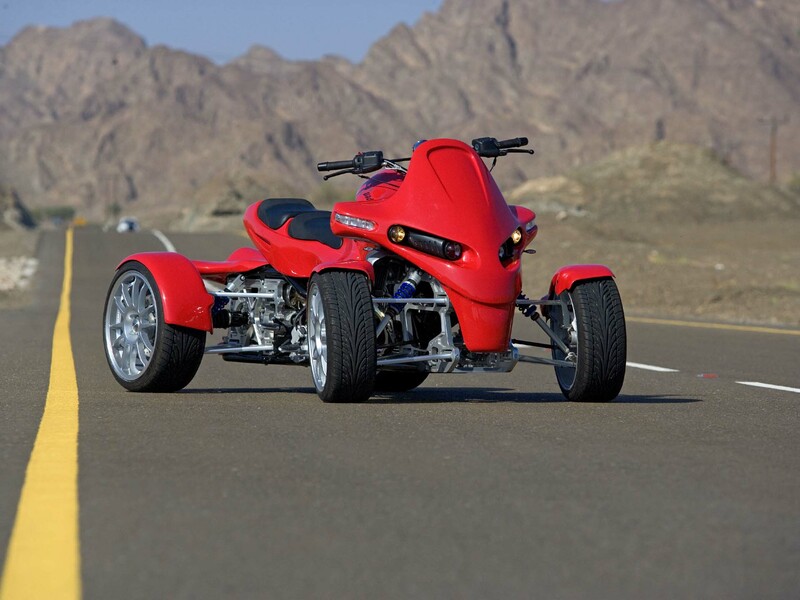 Maybe it could even do a wheelie. 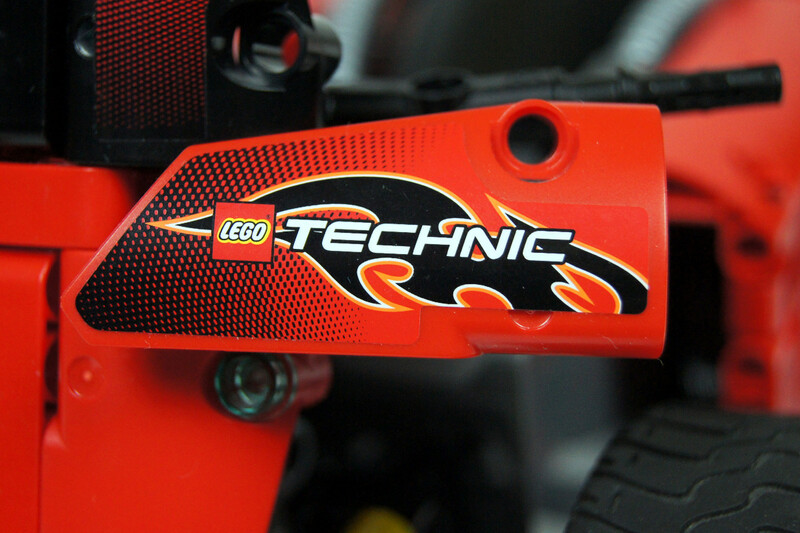 If you watch the video closely, there’s a notice at the end that says where I buy Lego pieces. And yes, that applies to wheels too. great idea, but where do you get the wheels that you have used? haha, great ideas the faq section at the end of the video (I receive always the same question). 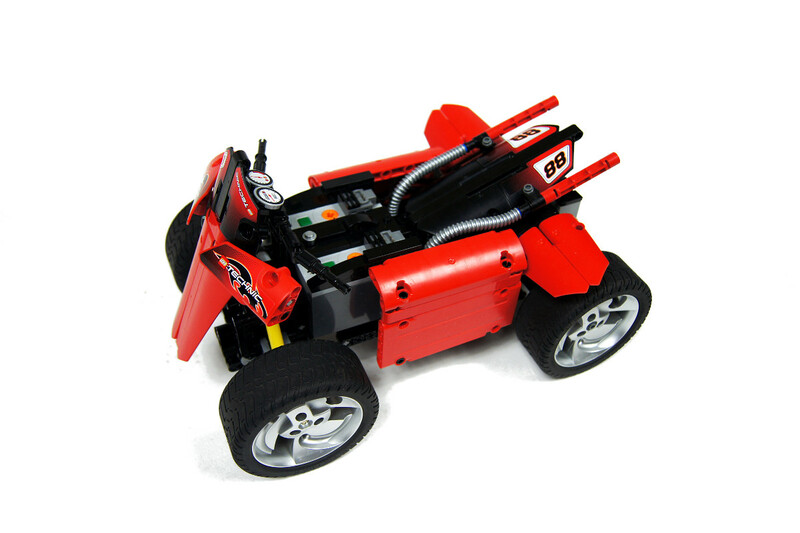 Too bas that the steering bar doesn’t turn and that wheel tend to fall off but it’s really funny, especially the low motion.